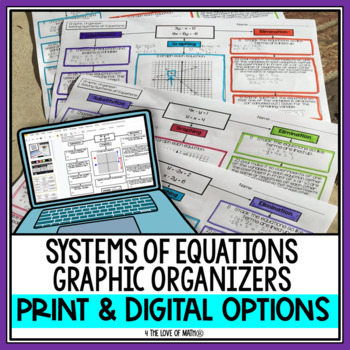 This is a set of graphic organizers on solving systems of equations. These pages are meant to be placed in students math notebook as basic reference sheets! 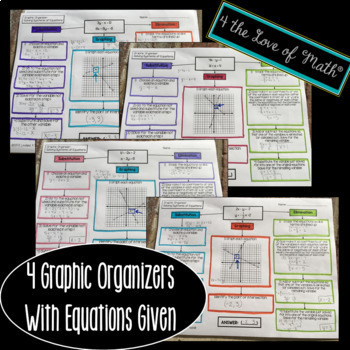 Students will use these graphic organizers to solve for 4 different systems of equations. They will solve the systems of equations using substitution, graphing, and elimination. 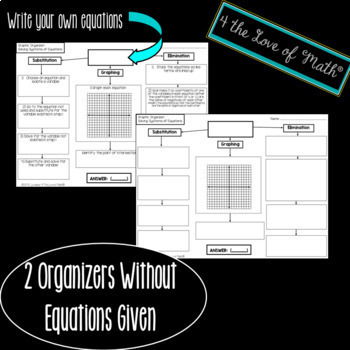 There are also 2 extra sheets that have space for students (or the teacher) to add their own systems of equations. One of these extra sheets still has notes to guide students through solving the systems. The other sheet is blank! They are an introduction to solving systems of equations and as such do not cover everything there is to know about solving systems of equations, it covers just the very basics! 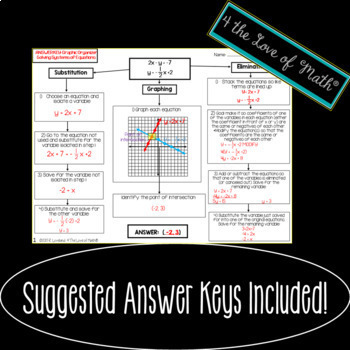 If you have any questions, comments or suggestions, please email me at: 4theLoveofMath2@gmail.com!